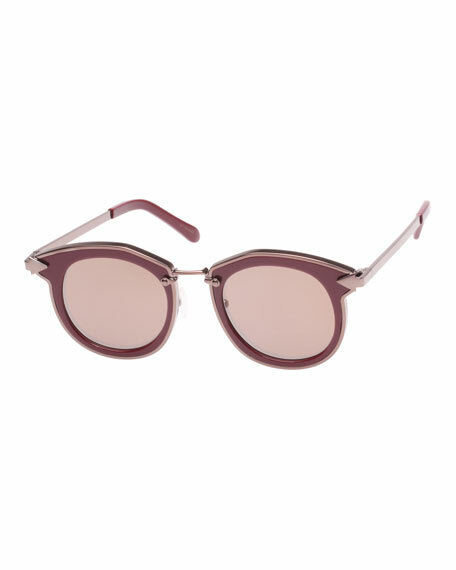 Karen Walker "Bounty" sunglasses with plastic frames. Metal nose bridge, frame front trim and temples. Garrett Leight "Beaumont" semi-rimless sunglasses in stainless steel metal frame with Lens/temple (in mm): 53-145. Gradient, round lenses. Authentic acetate inside Windsor rim. Cured cellulose acetate temples. Rivet hardware at lens front. Double nose bridge. 100% UVA/UVB protection. Made in Switzerland. Kendall + Kylie "Bella" sunglasses in metal, acetate and nylon. Lens/bridge/temple (in mm): 54-18-135. Round mirrored lenses. Double, curved brow bar. 100% UVA/UVB protection. Can be fitted with prescription lenses. Includes foldable hard case and soft pouch and cleaning cloth. Made in Italy. Moncler round sunglasses with acetate frames. Lens/bridge (in mm): 55-26. Mirrored lenses; logo script at left lens. Wide, adjustable elastic logo band wraps around head. Face foam cushion for comfortable fit. Logo detail at nose. 100% UVA/UVB protection. Made in Italy.